Ausra Inc. recently completed a modest-sized solar thermal power facility in California-said to be the first solar thermal project in that state in two decades-and the company has some ambitious plans, including a 177 MW solar thermal power plant in California. Officials at Ausra Inc. are going back to the future when it comes to electricity generation. The Mountain View, California, company bases its power production on the traditional steam turbine, which started the Industrial Revolution in the late 18th and early 19th centuries. What differs now is the method of heating the water. 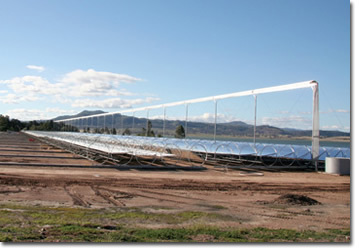 Ausra's Compact Linear Fresnel Reflector technology is comprised of a set of 10 flat mirrors that track the sun, concentrating solar energy on specially coated elevated stainless steel pipes, or receivers, that run parallel to the mirrors. Heat from the sun's rays boils the water, producing steam that is collected and routed to steam drums and then to turbine generators. Afterward, the steam is condensed back to water and returned to the solar field. "Steam has a long history," says Bill Conlon, Ausra vice-president of energy. "That was the mode of power that moved steam ships and steam locomotives. "One of the attractions, historically, of steam power is the economy of scale," he added. "When you double the capacity of the generation, it actually doesn't get twice as big. That means that it doesn't get twice as expensive." The company has ambitious plans in California; it has proposed a solar thermal facility that would generate more than 177 megawatts (MW) of power on the Carrizo Plain, east of San Luis Obispo. Known formally as the Carrizo Energy Solar Farm, it would feature 195 Compact Linear Fresnel Reflector solar concentrating lines on about 640 acres. Once the project is started, it would take about 35 months to full production, according to the Sacramento-based California Energy Commission. The project is scheduled to be online at partial capacity on or before May 31, 2010, according to the energy commission. The entire facility would be online and in commercial service the first quarter of 2012. The energy commission, which has the authority to license such power facilities, is reviewing the project and is expected to issue a staff recommendation shortly. In October 2007, Ausra applied to have the project certified. If the commission obliges, Ausra would be exempt from having to prepare a full environmental impact report, under the California Environmental Quality Act. But the company would have to prepare an environmental analysis, including a review of the alternatives and mitigation measures to minimize any potential adverse environmental effects. Two other firms have also proposed solar power generation facilities on the Carrizo Plain. OptiSolar Inc. of Hayward, California, has proposed a nine-square-mile project known as the Topaz Solar Farm. 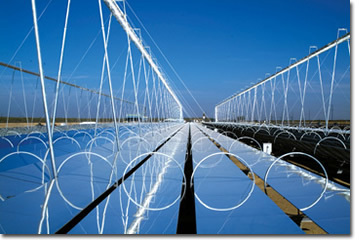 It would involve fixed ground-mounted systems using thin-film photovoltaic panels to generate 550 MW. High Plains Ranch II LLC, owned by SunPower Corp. of San Jose, California, has proposed a 250 MW facility. California Valley Solar Ranch, as it is called, would occupy about 3.5 square miles and use SunPower's high-efficiency crystalline PV panels on about 80,000 single-axis tracking systems. Utility company PG&E has agreed to buy all of the power produced from the three projects to meet a state mandate. By 2010, California utilities must get 20 percent of their energy from renewable sources. The massive scale of the three projects combined has raised some environmental concerns, Conlon says. "I think if it were just our project, it would be different. But these create an extensive footprint, so they're doing extensive studies." Ausra's mirrors are basically flat, making them much less costly to manufacture. The company's steam-concentrating technologies also have an advantage over traditional solar since they use less land per kilowatt generated. Although the Carrizo Farm still remains in Ausra's long-term plans, the company has shifted its near-term focus to building giant mirrors, absorber tubes, and other components at its 130,000-square-foot Las Vegas manufacturing plant. "We had productivity improvements with every one we built, so there was progressively rapid deployment," Conlon says. "We also learned how this is going to scale and how fast we can build so we don't have any bottlenecks." In addition, the company will promote a 50-megawatt system for smaller-scale uses, such as augmenting existing fossil-fuel power generation, steam-enhanced oil recovery, and steam production for food processing. "From the Ausra perspective, our goal is to be an OEM supplier of these solar thermal systems, as compared to an independent power producer model," Conlon says. Using solar to heat a liquid to power generators is not a new concept, Conlon says. During the 1980s, nine power plants-known as Solar Energy Generating Systems-with a combined capacity of 354 MW, were built in California's Mojave Desert. 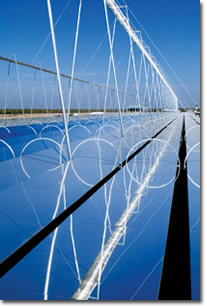 They used half-pipe-shaped parabolic troughs to concentrate the solar heat onto towers filled with synthetic oil. The super-heated oil is routed through heat exchangers to boil water, which eventually generates electricity in a conventional steam turbine. But the concept has been slow to take off because of the extraordinary costs to manufacture the trough-shaped mirrors, Conlon says. The hot oil also created environmental concerns when the collector tubes or flexible hoses leaked. The difference with Ausra's technology is the shape of the solar concentrators and the liquid that is heated. Ausra's mirrors are basically flat, making them much less costly to manufacture. The steam-concentrating technologies also have an advantage over traditional solar since they use less land per kilowatt generated, he says. Compared with traditional solar technologies, Ausra's technology may generate up to four times the kilowatts on the same acre of land and from one-and-a-half to two times the energy, compared with systems that use parabolic troughs. "The key to making this work is to use as little land as possible," he says. Like all systems that rely on the sun for energy, Conlon says Ausra's systems can't generate energy during the night. But the water retains enough heat to allow an orderly shutdown of power-generation equipment after sunset. Work on a Kern County, California, pilot plant began in December 2007, when the company was able to take over what was originally a wood-burning power plant that already had a steam turbine and electricity interconnections on site. Since Ausra was turning a former brownfield site into a greenfield site, Kern County officials were happy to oblige. "That allowed us to move quickly," Conlon says. "The only thing we had to do was get the permits from the county to install the equipment." Located west of Bakersfield, the Kimberlina Project currently produces about 3.5 MW and will eventually max out at 5 MW. Ausra's technology may generate up to one-and-a-half to two times the energy per acre of land, compared with some other solar thermal systems. The company began construction on the pilot plant in May 2008 and had an open house in October of the same year. The plant consists of modular boilers, three of which were constructed last summer. The company still needs to determine some specifics, such as the optimal arrangement of the mirrors and how high the receiver tubes should be above the ground. Plant managers also want to experiment with different steam qualities that have different moisture contents. "Kimberlina allows us to demonstrate a lot of different steam conditions," Conlon says. In 2004, Ausra built a 1 MW pilot plant in New South Wales, Australia, adjacent to a Macquarie Generation coal-fired power plant. A subsequent 38 MW solar field is expected to be completed this year. Conlon says Ausra hopes to take what it learns at the pilot plants and use it for the 177 MW power generation system it has proposed on the Carrizo Plains. In the meantime, the Ausra pilot plant is attracting a lot of attention from the petroleum industry around Bakersfield for steam-enhanced oil recovery, Conlon says. "I think we have the opportunity to do all of these things in new ways with new technology," Conlon says. "Even though this is old technology, and you don't think of it as high technology, my feeling is steam is going to be reinvigorated." Fossil-fuel combustion power plants are also looking at the green technology to augment their existing production. The Palo Alto-based Electric Power Research Institute recently completed a case study that looked at solar-augmented steam cycles for natural gas-fired power plants in Arizona and Las Vegas, says EPRI project manager Cara Libby. It is currently conducting a similar study examining the feasibility of solar-augmented steam cycles for coal-fired power plants in New Mexico and North Carolina. The two diverse locations allow for a more regional review, Libby says. It is scheduled for completion in September. "This has several advantages to a stand-alone plant," Libby says. "It takes a long time to permit a greenfield plant. We can use existing transmission lines and general plant permits, so some of these issues can be avoided if we don't start from scratch. Also, you don't have to purchase a new power block." The concentrated steam technology also has an advantage over straight solar energy since it can be integrated into existing steam cycles, she says. But the technology does have its limitations. "You've got to have a flat piece of ground next to the plant where you can put a solar field, so there are only a certain number of plants in the country that would qualify."